What is it – A popular spice blend belonging to the Northern part of the Indian Subcontinent. Its a blend of many different spices best known for the vibrant red colour that comes from the addition of bright red chilli powder. “Tandoori” refers to a cooking process where food is made in a special clay oven. “Masala” means spices in hindi. So as the name suggests its a blend especially used for dishes that is cooked in a tandoor oven. However modern day cooking have made this spice blend extensively used in multiple ways. Taste – Spicy hot and smoky. It is pungent and has a bitter sweet taste. Uses – Popular used to make marinades and rubs, it is also used to make veg and non-veg curries. Goes well with poultry, fish, Indian cheese and vegetables. What is it – A must have spice blend in every Indian household. It’s a combination of many different spices, blended together to make a traditional Indian spice mix. Every Indian region, state and household have their very own unique recipe. 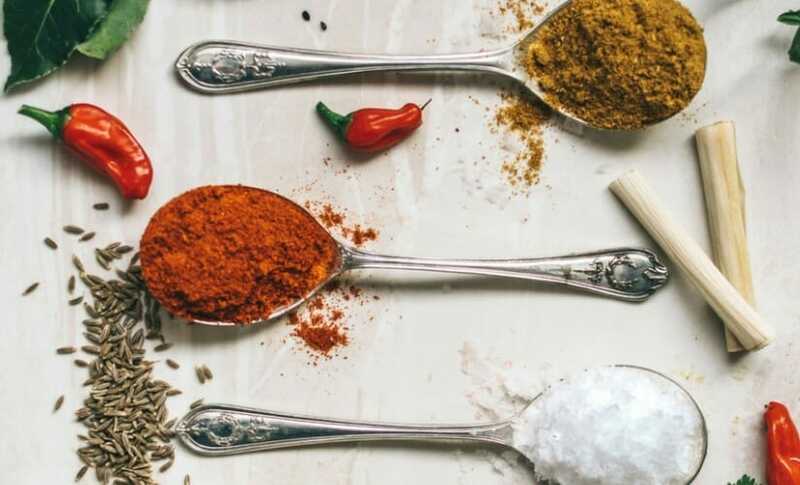 They can range from a mix of only 3 spices (like the Bengal Garam Masala powder) or up to 25 spices (typically the Northern Indian region).‘Garam’ is an Indian word for ‘Hot’ and ‘Masala’ means ‘Spice’. Taste – A strong and robust spice blend that is spicy and aromatic. Uses – Popular used as a seasoning for many veg and non-veg curries. Goes well with poultry, fish, Indian cheese and vegetable, lentils and legumes. Can also be used to make soups, stews and stir-fries. What is it – “Chaat” essentially is the name given for spicy, hot, sweet, tangy Indian Street food. This is a go to spice blend to season many Indian snacks. It is used more as a seasoning similar to that of salt and pepper to liven up finished food. Taste-Tangy with a slight pungency that adds flavour to a dish. Uses – Use as a seasoning mainly for Indian snacks, street food, salads, bbq seasoning and fruits. Can also be used for adding a tangy taste to yogurt dips, drinks, soups and veg curries. Goes very well with vegetables and legumes. What is it – An earthy, spicy curry spice blend used to make Indian style curries. Its a mix of different spices conveniently blended together making it easier for cooks to simply add a teaspoon to the base sauce giving it an authentic Indian curry taste. It adds flavour and colour to a dish. Taste– Pungent, spicy and hot. Uses – Used to make curries, soups, stews, stir-fries. Can also be used to make marinades and dry rubs. Add for making curry flavoured dips and dipping oil or sauce. Goes well with all food items such as veg, non – veg, legumes, lentils, rice dishes. What is it – Panch phoran, which literally translates to “five tempering spices”. It is a crunchy, salt free, blend of 5 whole spices very typical to Eastern Indian region. It is used to temper vegetables and non-veg dishes in warm oil. You can either crush the spices to release its oil before use or use them whole as the first step of cooking to flavour oil. Toasting the whole spices before use adds to its flavour. Taste– This is a non-spicy spice mix without any added chilli. Its aromatic and pungent and is used mostly to add flavour to a dish. Uses – Used at the very first step on cooking to flavour oil before adding vegetables or meat. Goes very well with ay vegetable or legumes. Can be used to make curries, stir-fries and as a pickling spice. You can also crush the whole seeds and use is as a dry rub.